Dexie during the mission Vinewood Souvenirs - Kerry. 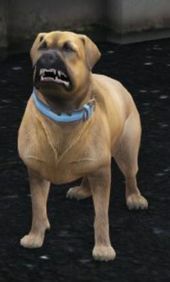 Dexie is a character in the HD Universe who appears as a minor character in Grand Theft Auto V.
Dexie is, in 2013, the pet dog of Kerry McIntosh who frequently takes Dexie on her shopping trips to Portola Dr in Rockford Hills, Los Santos. Nigel and Mrs. Thornhill, two British tourists have Trevor Philips (believing him to be Jock Cranley) to steal Dexie's collar for their celebrity items collection. Trevor confronts Kerry and then chases Dexie to a local fire station where he steals the collar. A news article for Prattle states that Dexie's collar is worth $3,000. This page was last modified on 3 April 2014, at 20:43.